This editorial is aimed at promoting the new series of Research Briefs in Population Research and Policy Review. These shorter, more data-centric articles complement the longer and more conceptually organized research articles published in the journal. Other major demography and population science journals, as well as interdisciplinary journals that feature demographic research, provide opportunities for this type of publication. We are very excited to offer this option for submissions to PRPR. 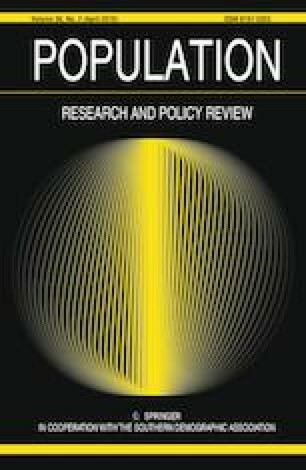 This new publication type presents scholars working within and across different social science disciplines a new outlet for publishing demographic research that is innovative and policy relevant but does lend itself to a full-length article. In this issue of Population Research and Policy Review, we publish the first article in our new series of Research Briefs. This new series presents an alternative publication type for the journal, its contributors, and its readership. As we envision it, the research brief article type is similar to our traditional type of article in that it offers a venue for scholars to present findings based on original empirical research that is subjected to peer review; however, this new article type entails only a brief review of the relevant literature. Demographers often have research projects that do not require an elaborate discussion of theories or findings from previous research but have the potential to make important contributions to the field. Yet, without a viable alternative to the traditional type of article, they face obstacles to “finding a home” for their projects in the publishing world. We see the research brief article type as an excellent outlet for demographers conducting research that is innovative and policy relevant. This new article type allows them to share their findings with the world. Population Research and Policy Review is certainly not alone in the acceptance or publication of this type of article. The Population Association of America’s flagship journal Demography and other top journals in our field, including Population and Environment and Journal of Marriage and Family, also accept research briefs, and Demographic Research accepts two similar article types as descriptive findings and research materials. Population and Development Review also hosts articles that are commentaries or shorter data and perspective pieces. All of these are geared towards publishing manuscripts that are generally oriented towards describing a succinct, self-contained finding related to population research. PRPR not only provides coverage of population research that is conducted by scholars in several disciplines, but also research that has implications for policies and programs. In fact, some of the articles we publish directly evaluate the effects of specific programs or policies. The addition of the research brief article type will allow policy-oriented researchers a great venue to publish their work. As one of the leading journals in our field, we are well poised to bring this new article type to the forefront of our field. Scholars employed at applied population research organizations often produce research and policy briefs from the projects they conduct that are descriptive with a singular focus. This new type of article offers these scholars and their organizations an opportunity to disseminate their findings into the broader publication sphere that the Springer publishing organization provides. The research brief also presents a nimble publication type for demographers who are working across disciplines, often with extremely large and non-traditional data sources, such as Twitter data (Cesare et al. 2018; McCormick et al. 2017). With the era of data science as an emerging pan-disciplinary field, research in demography is well situated to drawing from new data sources and applying new methodologies towards the end of understanding the human populations we study (Bohon 2018). The growth of data and code sharing platforms such as GitHub, the increased adoption of these tools, and the growing emphasis on reproducibility of research also provides a rich platform on which to produce more innovative and open types of demographic analysis. Our editorial board strongly encourages those among us who are working as demographic data scientists to consider this new publication type for their projects. While the guidelines for research briefs can be found on PRPR’s website, these research briefs should be short, less than 2500 words, excluding references and not have more than five tables and figures (combined) in their content. While the editorial board reserves the right to grant exceptions to these rules, we would like to stay within these limits when possible. Also, with concern to the peer-review process for the research briefs, they are reviewed using the same blind process as the larger original research articles; however, they will also be reviewed in an expedited manner, which should produce a shorter time to publication, conditional on the reviews. In closing this editorial, the editorial team of PRPR would like to invite you to read our new briefs as they are published, and to consider this avenue for publication of your own research. We are excited by this opportunity to continue promoting demographic and policy research that is innovative and interdisciplinary.